“How do I stream my live webcasts in 4K?” I won’t lie- this question makes me cringe worse than nails on a chalkboard. Now, my cringing reaction isn’t because they asked a terrible question, but rather because of the infrastructure limitations that exist at the current moment. The biggest culprit that currently hinders the explosion of streaming 4K Ultra High Definition (UHD) video is bandwidth. Keeping it simple, bandwidth refers to the amount of data packets that can be transferred over a network and/or internet connection. Measured in megabits per second (Mbps), this is basically the speed of your connection and the stuff that our Internet Service Providers (ISPs) charges us a premium to utilize. According to a recent report conducted by Akamai, only 21% of homes in the US have internet speeds of 15Mbps or higher- which is the suggested minimum amount of bandwidth needed to stream compressed 4K video. As any of us who watch streaming content regularly know too well, bandwidth does fluctuate, so a more realistic number would be 20Mbps to stream 4K without interruption. It is worth noting that Netflix suggests 4K UHD viewers have at least a 25Mbps connection. Although this bandwidth requirement seems a bit lofty, you would need in excess of 60Mbps to stream uncompressed 4K video. This is why HEVC (h.265) or VP9 compression codecs are applied to UHD video, which makes it a bit more practical to utilize. Even at a compressed 20 or 25Mbps, the audience of potential viewers is still limited and as we all know too well- bandwidth costs money. Drawing from my own personal production experiences, a lot of convention centers charge a hefty price for an internet drop, let alone for any decent bandwidth. On average, I have encountered upload speeds (the most important speed rating for webcasting) of around 5Mbps. Considering that a decent 720p HD stream can be had with around 3Mbps, this was not too much of an issue, but clearly 4K would have been an impossibility. The last piece of the 4K streaming puzzle is the platform or service where your streamed video can be viewed. Currently, most major content delivery networks (CDNs) will support up 1080p at the maximum, but it is still quite common to stream in 720p. Some services like YouTube do allow you to upload pre-recorded 4K content, but streaming is still limited to 1080p. Although companies like Beamr hinted at a solution last year at CES that promised to compress UHD down to under 10Mbps, actual live streaming in 4K is still a bit illusive. The good news is that these compression advancements can be applied to non-streaming 4K content, making storage and transport easier. After seeing the extra detail and leverage 4K can provide to producers and editors, it is no wonder why the industry is anxious to produce and stream 4k content. 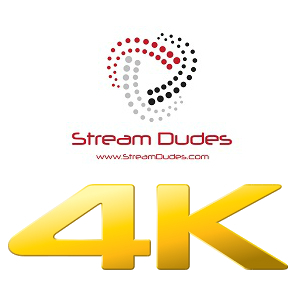 We know the 4K streaming revolution is very close, which is why we here at Stream Dudes are getting behind 4K video production solutions. Although it is not yet feasible to live stream 4K video, it is wise to begin producing UHD content. I will be excited to see what NAB 2016, Streaming Media East and IBC will bring forth this year for 4K streaming, so rest assured that Stream Dudes will keep you up to date.